This is a history lecture. I'll try to make it entertaining. The history of modern Zimbabwe begins with two dead white men. Extraordinarily famous dead white men: both are more than a century deceased, but you probably know their names. Conveniently, their stories dovetail nicely with where I've been over the last few days. Almost exactly one hundred and fifty years ago, on November 16, 1855, David Livingstone (as in, "Dr. Livingstone, I presume? "), who was in the midst of an expedition across Africa - primarily to carry the word of God to the heathen, but also to survey the continent and open trade routes - was led by his native guides to what, from a distance, looks exactly like a bushfire. Then, as you get closer, it sounds like thunder. Hence the African name Mosi-oa-Tunya, "the Smoke that Thunders." But Livingstone was a loyal royalist Brit: and so, once he picked his jaw from where it must have fallen - because this mile-wide, 100-metre-deep curtain of falling water really is a stunning sight - he promptly rechristened it Victoria Falls. It may not actually have been a mile wide at the time. It would have been, like now, just the end of dry season; and as I type, the entire Zambian side of Victoria Falls is dry. You can walk right along that edge of the basalt gorge that is the Falls, if you like, on massive water-worn stones whose bored holes and smooth, fluted edges make look uncomfortably like jumbled bones, and peer over the edge. Not that there's nothing to see. The Zambezi still tumbles in huge cataracts over the slightly lower Zimbabwe side, at a rate of tens of millions of litres per minute, into an opaque white maelstrom beneath, across which arcs a standing rainbow. On a full moon's night, you can see a moonbow. Even at this minimal flow rate, spray rises high into the sky. When I looked up from the Zambian side at midday, I saw, to my amazement, a perfect rainbow ring around the sun. The colossal gorge over which the river tumbles is narrow enough that you could hurl a well-thrown baseball across, and sheer on both sides. Mist from the falls settles constantly on the patch of land that stands just opposite the permanent Zimbabwe side of the waterfall; this has perpetuated a tiny standing jungle maybe 500 feet long and 100 wide, wet and thick with ferns, creepers, and other jungle vegetation not otherwise found for a thousand kilometres in any direction. Between the falls and the microjungle, it's an amazing sight. When Livingstone discovered Victoria Falls, a little boy in England named Cecil was two years old. Seven years later, Cecil was diagnosed with tuberculosis. His parents were told he would not live past twenty-one. At age seventeen, in the hopes that the southern air would aid his lungs, his parents sent him to visit his brother, who had recently emigrated to South Africa. Cecil died before he was fifty. But he had quite an eventful life. During his five decades, two countries were named after him (Northern and Southern Rhodesia); he was named the Prime Minister of a third (South Africa); he was also - at the same time! - the Managing Director of one of the most powerful companies in the world (the British South Africa Company); oh yes, and for the last decade of his life he was widely believed to be the richest man on Earth. Today, he is now best known in North America for the scholarships he endowed in his will. Every Rhodes Scholar attends Oxford on the tab of Cecil John Rhodes' estate. It's not clear what exactly happened with that section of his will which left money "To and for the establishment, promotion and development of a Secret Society, the true aim and object whereof shall be for the extension of British rule throughout the world"; his trustees are clearly, to say the least, falling down on the job. Rhodes made his fortune from the diamond fields at Kimberley, where there was initial find, a diamond rush, and then, after all the easily accessible diamonds had been mined, a collapse. Rhodes' shrewdly bought up all the claims that other miners were selling cheap; then, new pumping technology allowed access to a prodigious amount of previously unaccessible diamonds, and Rhodes' De Beers Mining Company (named after the farm on which the original discovery was made) owned almost all of them. From Bulawayo, the railway went west to Victoria Falls, across a bridge that was built to span the Zambezi in 1895, and continued north until it reached the Congo border. En route, Rhodes, the British South Africa company, and the pioneers it financed and encouraged conquered (or signed extremely unequal treaties with) the Shona and Matabele, and created two new countries; Rhodesia (now Zimbabwe) and Northern Rhodesia (now Zambia). The railway never made it to Cairo. The Boer War interfered; then Rhodes died of ill-health in 1902, and no one shared enough of his vision to force the railroad on. I'm sure he'd be pleased to know that today, though the line to Beira long since ceased operation, and much of the Zambia line isn't currently running, at least you can connect from the same tracks that he built as far as Dar es Salaam. Rhodes' grave can be found at a place called Malindzidzi - "World's View" - in Matopos National Park, where I spent yesterday. 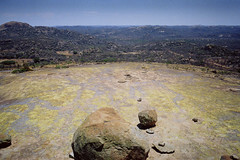 During my last visit, my Lonely Planet said, in a flight of fancy which has surely since been edited out, "You don't have to believe in ley lines and crystals to know that the Matopos Hills are one of the power places of the world." It's an otherwordly place. Incredible crystalline hills and ridges of granite jut out from the African bush, where leopards and rhinos roam. Malindzidzi, a natural ring of colossal boulders atop a huge solid-granite hill, rising above the rest of the park, is one of the most starkly beautiful places I have ever been. I'm grateful I got the chance to see it for a second time. Rhodes wrote that he chose it for a resting place because of its "grandeur and loneliness." I know exactly what he meant. Let's jump forward to 1948. That's the year that the British Airways Overseas Corporation inaugurated its weekly passenger flying-boat service from England to South Africa. Passengers flew from Southampton to Sicily to Alexandria to Khartoum to Port Bell (now Entebbe) to Victoria Falls to Jo'burg, flying one leg a day, 12,000 feet above the planet, overnighting at each of those destinations. From Vic Falls, you could ride Rhodesian Railways' luxury first-class cars north to the Congo, east to the Mozambican coast, or south to Cape Town. Does that sound fabulously exotic and romantic? It should. It was. It was the glory age of African colonialism. In 1948, my father, born in what was then Umtali and is now Mutare, in Eastern Zimbabwe (hence my deep and abiding interest in this country, in case you're curious) was nine years old, and attending a more-British-than-British boarding school in the leopard-infested Vumba rainforest. 1948 was also, note, one year after India became fully independent. That's an important fact about Rhodesia; it was, in many ways, the absolutely last vestige of true British colonialism on the planet. When my cousin visited here, a decade ago, somebody at an all-white braai asked her what she thought of the Rhodesians around her; and she answered, memorably, "You're like the seaweed flung onto a rock by the highest wave of the highest tide, and left there to dry." Here's something else you should know about colonial life: it was wonderful. Oh, it was hard, challenging, too - but whites in Rhodesia lived, for the most part, as well as those in the Raj. No; better. Big houses with spacious verandahs, massive farm properties, vistas of extraordinary natural beauty all around, braais and fresh mangos and just-laid eggs, expeditions to Cape Town or Mozambique or to hunt the leopard that's preying on the cattle, days spent on horseback riding across your domain, a tight-knit community of fellow whites, servants to cook your food, make your bed, prepare your saddle, work your fields, build your house - many if not most Rhodesian whites lived, literally, like medieval kings. There was, however, that inconvenient fact that all this splendor was built on the back of colonized Africans who were little more than serfs. Why did otherwise intelligent and often kind people fight so hard for the vicious, obscene, evil system in which they lived? Because they knew that if it changed, their lives - and the lives of those they loved - would never be anywhere near as good. It couldn't last, and it didn't - but note that Rhodesia became Zimbabwe only twenty-five years ago. That ends this lecture. There will be more to come, I'm afraid. Pay attention. Take notes. There will be a test.